It is summer for us and spending time in the kitchen during the hot months is quite challenging. 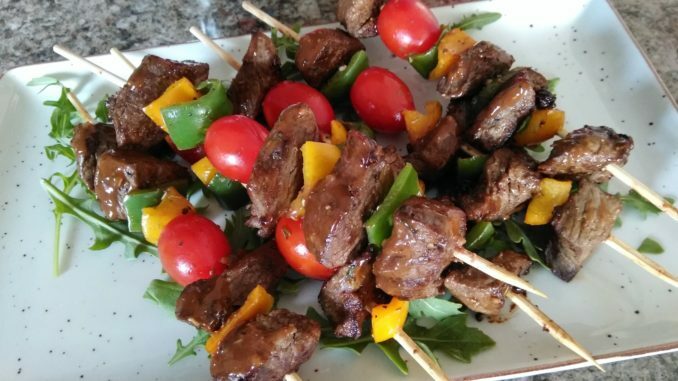 Quick and simple recipes are in order, and beef kebabs fit the bill! I recently decided to make grilled kebabs, along with vegetables, to bring to our church picnic. The marinade is super simple and quick to prepare. This recipe would best suit those who don’t own an outdoor grill and/or those who do own one, but do not feel firing up the outside grill. All can be prepared and cooked indoors! Season the beef steak with the traditional braai mix and garlic & rosemary spices. In a medium bowl, whisk together soya sauce, honey & mustard, braai sauce, 1 tablespoon of olive oil and the fresh chopped thyme & rosemary. Add the rump steak to marinade and toss well to coat. Cover with a plastic wrap, refrigerate and let it marinate for 30 or up to an hour. Once the beef is marinated, heat a chargrill pan over medium heat and coat with just a tablespoon of oil. Add the marinated steak into the pan, grill for 12 to 15 minutes on each side or until well browned, baste the steak with what is left of the marinade just before removing them from heat. Great idea to cook the meat and vegetables separately and only put them on the skewer once the individual items are ready. I’ll have to try this sometime.